Bruce Poliquin during his 2012 primary run for the Republican nomination for U.S. Senate. AUGUSTA, Maine — Bruce Poliquin ended months of speculation about his aspirations for political office Monday when he announced his candidacy for Maine’s 2nd U.S. House District seat. Former Senate President Kevin Raye of Perry followed Poliquin’s announcement Monday morning by saying he too is seriously considering a run but won’t make an official decision until after Labor Day. 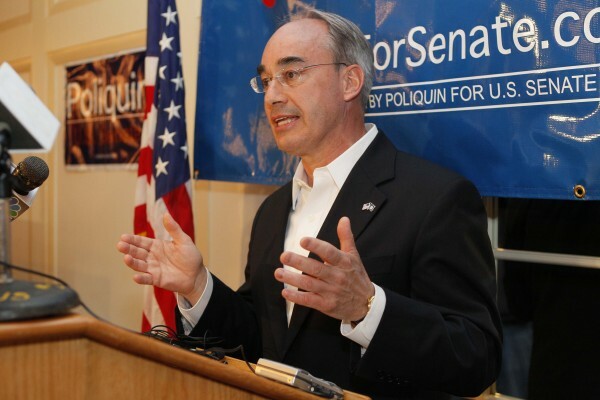 Poliquin, a Georgetown resident who has long said his attempts to gain elected office were not over, made his candidacy official Monday morning on a WVOM radio show. Poliquin, a close ally of Gov. Paul LePage, has become one of the more high-profile Republicans in Maine in recent years. In 2010, he lost in a seven-way primary for the governor’s office to LePage, but then campaigned for LePage, helping the Waterville Republican win the general election. After taking office, Poliquin served for two years as state treasurer. He used that post to advocate for conservative fiscal policies in line with those promoted by the LePage administration. After Democrats in November 2012 regained majorities in the Maine House and Senate, the Legislature replaced Poliquin as treasurer with Democrat Neria Douglass. Poliquin lost another primary battle for federal elected office last year, this time a six-way race for the Republican nomination for a U.S. Senate seat vacated by Republican Olympia Snowe. Poliquin lost that primary to Charlie Summers, who then lost the general election to former independent Gov. Angus King. Since then, Poliquin’s name has surfaced in speculation about several political posts from the Maine Senate District 19 seat vacated last month by former Senate Majority Leader Seth Goodall of Richmond — the election for which is Tuesday — to the chairman of the Maine Republican Party. Poliquin was briefly rumored to have an interest in becoming LePage’s next commissioner of education a few months ago, but he quickly rebuffed that. Education Commissioner Stephen Bowen announced earlier this month that he is resigning to take a position with a national education foundation. Poliquin does not live in the 2nd District, but no law requires that he do so to represent the district in Congress. Poliquin had not made his candidacy formal with the Federal Election Commission on Monday evening but told the radio program Monday morning that he intends to do so on Tuesday. Poliquin, who could not be reached Monday for comment, is the third Republican to make official his candidacy to succeed six-term U.S. Rep. Mike Michaud, a Democrat who earlier this month announced plans to run for governor in 2014. House Assistant Minority Leader Alex Willette of Mapleton has been campaigning for weeks and Blaine Richardson of Belfast, who lost the 2012 2nd District GOP primary to Kevin Raye, also plans to run. Michaud’s departure removes the power of incumbency from the 2nd District election for the first time in a decade. Raye said he sees the opportunity to run for an open congressional seat as too good an opportunity to pass on. The Democratic side of the ticket is likely to see a primary as well. Sen. Emily Cain of Orono and Senate Majority Leader Troy Jackson of Allagash have already entered the race, as has political newcomer Alden Smith of Sangerville.